Colma, Oct. 27. 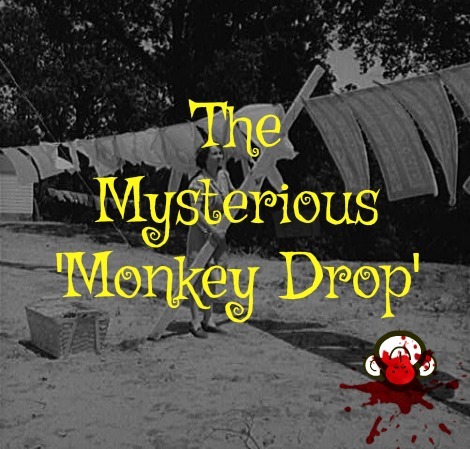 -- The civil aeronautics authority and the Broadmoor district police are today investigating the case of the monkey which fell out of the sky. The animal landed on Mrs. Faye Swanson's clothesline and did severe damage, mostly to itself. Mrs. Swanson, who lives at 723 Stonyford drive in Broadmoor Village subdivision, said she walked into her backyard yesterday at 8:05 a.m. and found a dead monkey on the ground. Her clothesline was almost bent to the ground and pieces of monkey still clung to the plastic covered cable line stretched between a pair of four by four wooden posts. The posts were cracked at each end. "Who's going to pay for having my clothesline fixed?" Mrs. Swanson asked. CAA investigator Joseph Markovic, who was dispatched from his office at Mills Field when the monkey "drop" was reported to the SPCA by Police Chief Ray Savage, looked puzzled. "My specialty is aircraft maintenance inspection," he said. "I'm just here to take a report and find out all the facts, ma'am." The five-pound body of the monkey was taken to the SPCA headquarters at Coyote Point for an "autopsy" into the cause of death. Everyone agreed he had "fallen from a great height." Chief Savage declared preliminary indications are that the monkey died of heart failure during his drop. But the big question remains--was it dropped from an aircraft, or are monkeys dropping from the sky because of the H-bomb tests in the South Pacific? A check with Pan American World Airways, which specializes in carrying animals aboard its Pacific clippers, quickly denied any responsibility for this particular arrival. Other airlines also failed to yield information concerning the deceased monkey's origination. Maybe he was just an airline hitchhiker, someone suggested, and lost his grip. Robin Kincaide, assistant public relations director for PAA, said the airline had not flown any monkey cargoes into the United States since Wednesday. And since the monkey "drop" in Colma apparently occurred Thursday night or early Friday morning, Pan American couldn't be responsible. Further, he stated, even if the monkey was aboard a PAA clipper it couldn't possibly have gotten out. The airlines fly many Rhesus monkeys from the Philippines to the U.S. for laboratory experimentation and to aid in making polio vaccine. But they are kept padlocked in wire cages, are sealed behind pressurized doors in the cargo compartment, and if, by some stretch of the imagination, did get out of this area, the main section of the plane is also pressure sealed for high altitude flying.